I hope everyone had a great weekend. I did… Just a bit tired from all the running around and hanging out with my cousin but it was a lot of fun. So, I am very behind on my blog reading, emails and such but I promise to catch up soon. For now, I’ll leave you with a picture of my latest bookbinding creation. This is a book made with the secret Belgian binding technique. You can’t really see the binding because I added navy leather to cover it but since the leather is pressed on the effect is one of a raised look on the spine from the individual threads, making it quite nice and decorative. I am working on a new book and will leave the binding exposed so you can see it. The book measures 4 1/4 by 3 1/4 so it’s perfect to stash away in a pocket. Aside from learning this binding, the good thing about working on this book was that I got to use a drill to make the holes in the wood I used for the panels. That is something I never thought I would ever do (I’m such a girl!). I also had to work with a paring machine again to thin out my leather. Finally, I used marbled paper for the end papers. I need to take better pictures of this and add it to my finished book projects page but I’ll save that for another day. For now, it’s time I relaxed with some good books. I love your book. Your marbled paper is adding mystery to your Belgian beauty. I do have a question concerning making books. Would you recommend a book that would show different stitches that you can do going through the spine when you attach the signatures. I am interested in trying that out. I really enjoy your blog by the way. I’m starting a small lit mag at my school this fall and am thinking about doing some sort of cheap binding myself… I haven’t decided yet. It’d definitely have to be easy and quick, but attractive…. hm. Wow, it’s beautiful! 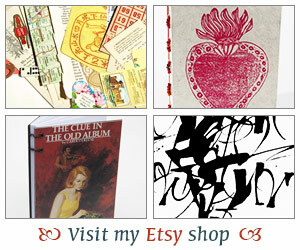 I really have to get over to the craft shop and start binding! Wow! That’s gorgeous! I wish I knew how to make books. From what I can see it looks great! Can’t wait to see the more detailed pics on your book projects page! Oh it is gorgeous! I love the marbled end papers! I just read about the secret Belgian binding the other day! Your new book is just lovely. I wish I had one! It is beautiful! That’s so cool! I’d love to try that out! Roxane – Thank you so much. Isn’t the hand marbled paper wonderful? I love that no one paper is alike. 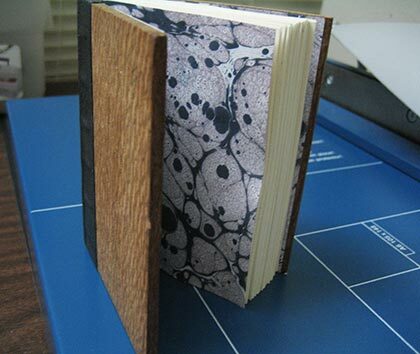 If you want to try your hand at bookbinding, I’d highly recommend Shereen LaPlantz’s book, Cover to Cover. Lots of good projects like the ones you are looking for and the instructions and pictures are fabulous. Let me know if you try it out! For a lit magazine I would think that a simple pamphlet stitch would work great. I would use a 5 hole stitch just to give it a bit more of a finished look. Do a google search and I bet you can find a quick & easy tutorial. nik – What are you waiting for – get over there and try it out. I’ll be super jealous though because I can only imagine what wonderful decorative papers you will have over there. I love working with Italian print paper. The designs are gorgeous. Anna – Bookbinding is really a lot of fun. If you want to try it out there are tons of books although I would first suggest a class rather than a book. Just because you can get acquainted with some of the tools, ask questions and that sort of thing and then you will probably have an easier time following a book. Jenna – The binding just requires a bit of patience but it’s a lot of fun. Its gorgeous!!! Love the marbled paper. That’s an awesome book, Iliana. You are such a gifted crafter. Christine – Thanks girl! That paper is beautiful isn’t it? Did I ever show you my other book I made with that paper on the cover? These were just the scraps! Literary Feline – Aw, thank you! Jordan – Glad you liked it! Thank you for the book info. I am going to check it out tomorrow at Titlewave in Anchorage. I will keep you posted on my efforts. Love that book!! The endpapers are just stunning. I can’t stop lookin’! roxanestoner – Please do let me know if you try one of the projects! I’d love to hear how that goes. Although I much prefer to learn in a class setting well sometimes that’s not possible. There are a lot of bookbinding books out there but some of course don’t have as well-written instructions and I think this one excels at that. And, of course good pics & diagrams to follow along!